« Older: Police suspect retaliation in murder of Frank Edwards Jr. In Issue 47 Volume 25 of The San Pedro Sun, news was reported of a fire incident at the Princess Royal Youth Hostel located on Mile 21 of the George Price Highway, which claimed the lives of three teen-aged girls who were in solitary confinement. More than three months later, the Ministery of Human Development has finally completed their investigation and has confirmed that one employee has been fired as a result, and several others are facing disciplinary actions. And, while the lives of the three girls cannot be returned, the Ministry hopes that steps will be implemented to ensure a tragedy such as this never occurs again. According to Chief Executive Officer of the Ministry of Human Development, Judith Alpuche, protocol was breached when the girls were locked in a room without immediate supervision. "The investigation that we did was internal to us, because we needed to understand what went wrong and for our own clarity and for us to take the necessary actions as well. The processes that we're talking about, are processes that have to do with disciplinary procedure. In our case, one person has been terminated because that was within the purview of the Ministry to do that. But there are other people who have to go through the public service process because they come in the domain of the Public Service. The report is completed, but we have been advised that there are certain processes that are still on going in terms of disciplinary actions that need to be taken, etc,” explained Alpuche. She explained that the Ministry of Human Development will be issuing a full report on the finding of the investigation and the names of those implicated in the near future. 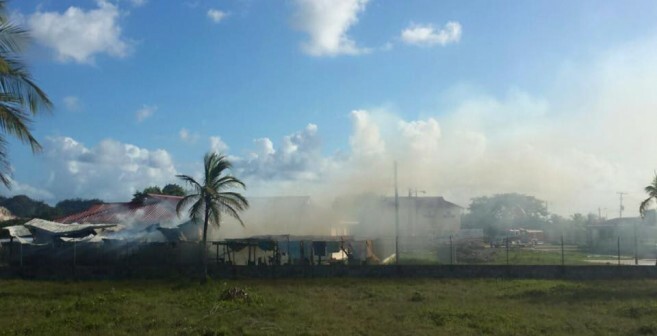 The incident occurred on Sunday, November 29th shortly after 2:30PM, when a wooden building caught on fire where 16-year-old Ana Melinda Carlos, 16-year-old Shadisha Arnold and 14-year-old Elizabeth Mckoy were being kept in solitary confinement as punishment. Attempts were made to stop the fire and rescue the teens but all failed, resulting in the death of the girls. At the time, there were two female wardens supervising the 30 girls who were residing at the hostel. Reports indicate that the fire was started with a lighter that was allegedly smuggled in by one of the girls.